CoinNews photo of a 2018 Australian Kookaburra Year of the Dog Privy Mark 1oz Silver Bullion Coin. The gains happened against a backdrop of divided precious metals in November with LBMA prices for the month up 0.2% for gold and down 0.7% for silver. Sales of Perth Mint gold coins and gold bars shot up to 64,308 ounces last month — the most since January 2017, scoring increases of 74.6% from October and 169.1% from November 2018. Year to date gold sales at 372,863 ounces are 10.2% higher than the 338,401 sold through the first eleven months of last year. The Perth Mint sold 876,446 ounces in silver coins and silver bars in November, marking an 18.8% decline from October but a 61% increase from November 2017. 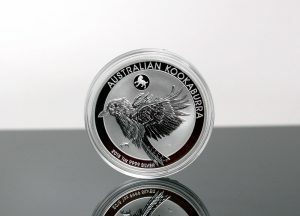 The sub-million tally was the first in three months although markedly higher than other months in 2018 like June, when silver sales totaled just 229,280 ounces for the lowest amount since CoinNews started tracking the Perth Mint’s monthly data in February 2013. Perth Mint silver sales for the year so far at 8,550,087 ounces are 2.4% lower than the 8,761,971 ounces sold through the same period last year. Below is a monthly summary of Perth Mint bullion sales from November 2017 to November 2018. The figures show monthly ounces of gold and silver shipped as minted products by The Perth Mint to wholesale and retail customers worldwide. It excludes sales of cast bars and other Group activities including sales of allocated/unallocated precious metal for storage by the Depository.